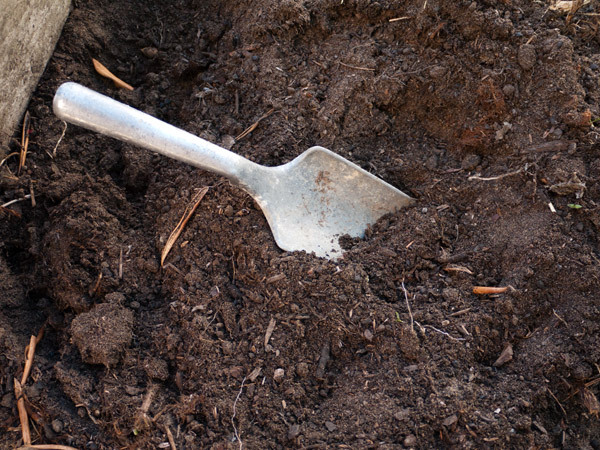 Test your garden soil for lead. Lead contamination in backyard soil is common, and lead is toxic. Even at low doses, it can cause brain damage, nerve disorders, muscle pain, reproductive problems, and other serious health issues — especially for babies and children, whose nervous systems are still developing. Why would there be lead in my garden soil? And again: it's especially important to check for lead if you have children, plan to have children, or plan to share your garden bounty with people who have children. Contaminated soil? Build raised beds. Make your beds a minimum of 8" deep; 12-16 or deeper is better, especially if you want to grow root vegetables like carrots or beets. Line the bottom of the raised bed with a layer of water-permeable weed-blocking fabric, to keep your plants' roots from growing into the contaminated ground below. Fill the beds with clean soil and compost, or planting mix. Do not use pressure-treated lumber or railroad ties for your raised beds: both are treated with fairly nasty chemicals. Immobilize and/or cover up the lead-contaminated soil so you're not kneeling in it, breathing the dust, or tracking it into the house. You can make it less bioavailable by raising the pH of the soil (making it less acidic) or adding bone meal to the soil; but be careful not to stir up lead-contaminated dust while you're adding amendments. Then, cover the soil with landscaping fabric and thick layers of mulch, gravel, or paving, or with non-edible plants, such as grasses or shrubs. A lab can test your soil for lead (and usually everything else you want to know) for under $20. It's easy: you mail them some dirt, they send results back in a week or two. I don't know of any home test kids that are considered reliable. You can find a lab through the National Lead Information Center (NLIC) at 1-800-424-LEAD or visit http://www.epa.gov/lead, or by contacting your local Cooperative Extension office — you can find them through http://www.csrees.usda.gov/Extension/. Tell them you want to have your vegetable garden soil tested for lead — they'll have directions for collecting and packing the soil samples. The test should be $20 or less. You probably won't need the more expensive tests, but if your garden is or used to be near a railway, factory, wood yard, refinery, auto shop, or dump, they may advise you to test for other pollutants or heavy metals. Free or very low cost tests may also be available through your county. 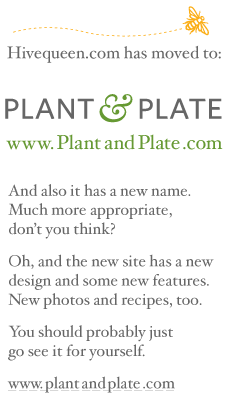 I used the Soil and Plant Tissue Testing Lab at UMass Amherst: http://soiltest.umass.edu/services — other labs may be just as good. Their Routine Soil Analysis was $10. I got tests for each of the garden sites I was considering: front yard, side yard, back yard near the house, back yard away from the house. No special tools; I just used a trowel to scoop some dirt from the top 6" of the soil. To make sure I got an average reading, I collected a half dozen samples from each site, mixed them all together in a clean bucket, then scooped a cup of the composite sample into a labeled zip-lock bag and mailed it to the lab. The report told me the levels of lead, cadmium, and other pollutants (very low... phew! ), plus the soil pH (how acidic it is), and levels of all the important micronutrients a vegetable garden needs. It also explained how to interpret the results and gave several different suggestions for soil amendments from both natural sources (manure, bone meal, wood ash) and commercial type fertilizers. 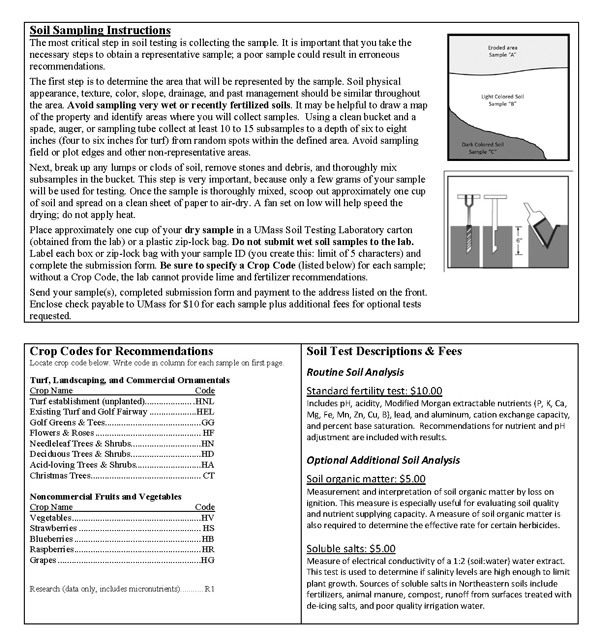 "Routine Soil Analysis for Turf, Landscaping, and Home Gardening," instructions from the Soil and Plant Tissue Testing Lab at UMass, Amherst. Click to get the order form and instructions in PDF format. Lead is very serious! I am NOT a lead remediation expert. If you suspect you have lead contamination, do contact the National Lead Information Center (NLIC) at 1-800-424-LEAD or visit http://www.epa.gov/lead — they can give you much more complete information and put you in touch with lead specialists in your area.